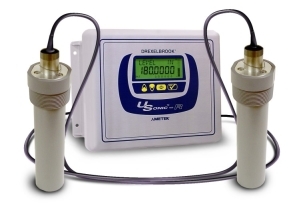 Drexelbrook's Ultrasonic level transmitter, USonic, is part of a family of 2-wire, HART compatible, ultrasonic level transmitters with premium features in a durable and economical package. Drexelbrook has decades of experience with ultrasonic level measurements and the result is a unique ultrasonic level transmitter that can take on and simplify applications never previously thought possible for the ultrasonic technology. 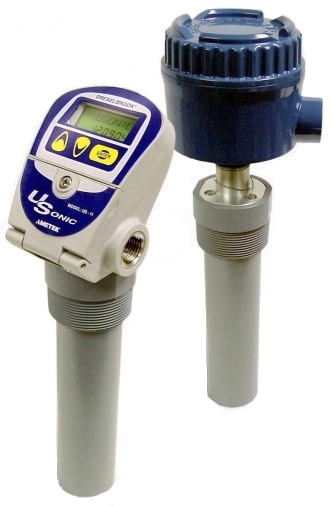 USonic also brings a number of unique features to the market that make using the USonic ultrasonic level transmitter a simple and cost effective solutions for liquids and slurries. The USonic range of ultrasonic level transmitters include many standard features like the patent SMARTgain™ algorithm for auto profiling, PipeSoft for ferrules and underground tanks and industry leading accuracy and response time. The USonic Ultrasonic level transmitter is also IECEx approved for intrinsically safe Ex ia which makes it ideal for hazardous areas. The housing, keypad and display are also UV and weather rated for use outside without the need for sun or weather shielding. A patent algorithm that automatically profiles the ultrasonic level transmitters surrounding environment to ignore obstructions like ladders and agitators that can interrupt the sonic signal. No more tedious tank mapping procedure. SMARTgain™ runs automatically without any user input required and does not require the vessel be emptied as future obstructions are automatically adjusted for. Another way Drexelbrook is making the Ultrasonic level experience easier and more reliable. Ever wanted to use an ultrasonic level transmitter when a long and narrow ferrule or nozzle was involved? Well now you can. In the past long nozzles and ferrules that open up to a large area, like an underground diesel tank, would play havoc with ultrasonic level transmitters. The signal bounces of the walls of the pipe and scatter on exit meaning measurement past this the end is lost. This is where Drexelbrook unique PipeSoft comes into it's own by being able to make measurements off these scattered sound waves. The result is an Ultrasonic level transmitter that can be used for underground pits, tanks or vessels with ferrules as long as 7 meters. Aside from being an accomplished Ultrasonic level transmitter. The USonic is also an excellent open channel flow meter. Drexelbrook's USonic comes complete with many common weir and flume functions as well as the ability to program your own geometry for optimum flow measurements. Having a fast response time is a key advantage for an Ultrasonic level transmitter. The USonic family has a standard response time of 300 ms which is the fastest in the industry. Response time enables an ultrasonic level transmitter to respond quickly to changes in the process particularly important for filling, emptying or upset scenarios. UV Rated display for full sun exposure. No shade required. The USonic R ultrasonic level transmitter expands on the the features list of the USonic with options like dual sensors, relays output, modbus, data logging and additional programs for batch control and multiple tanks.